Three days later, there was a wedding in Cana of Galilee. Jesus’ mother was there. 2 Jesus and his disciples were also invited to the wedding. 6 Six stone water jars, which the Jews used for ceremonial cleansing, were standing there, each holding twenty or thirty gallons. 7 Jesus told them, “Fill the jars with water.” So they filled them to the brim. 8 Then he said to them, “Now draw some out and take it to the master of the banquet.” And they did. 11 This, the beginning of his miraculous signs, Jesus performed in Cana of Galilee. He revealed his glory, and his disciples believed in him. Setting: We know Jesus was just baptized by John and beginning his earthly ministry at the age of 30. Right after his baptism Jesus headed into the desert to be continually tempted by Satan for 40 days. Now he had returned to the area and by the time of this miracle had already gathered six disciples: Andrew & John; Peter and James, Phillip and Nathanael. By the time they arrived back into the area around Galilee best I can tell, they had known each other for about a week. Would you have put your faith in Jesus if you had been there in Cana? When people come face to face with Jesus’ powerful works it demands a reality check. He turns water into wine, cures the cripple, raises the dead; what do you think? He spares a life you thought was over. He heals a disease they said was terminal. How do you react? And for how long? If you tasted the best wine you’ve ever had created by Jesus from foot washing water, how long would you be impressed? Would you always put your faith in Jesus from a glass of wine? “He was oppressed and afflicted, yet he did not open his mouth; he was led like a lamb to the slaughter, and as a sheep before its shearers is silent, so he did not open his mouth”. Wouldn’t it have been great to sit around the table in the evenings talking to these disciples and listening to what bits and pieces of Jesus being the Lamb of God they really understood like you do!?! Here are the basics: Jewish weddings lasted for days, maybe a week. Wine was the drink of choice at every meal because you couldn’t trust the water. For whatever reason the wine had run out and the couple’s reputation was headed for embarrassment. Of course there were twelve eyes watching the drama and you better believe those eyes got as wide as Frisbees! Everyone knows that the older the aged wine the better. But, Jesus defied time as he turned water into wine. The bar manager was given a glass of wine and bears testimony to Jesus’ quality. 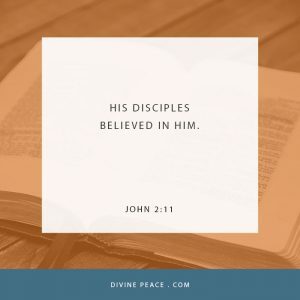 Did the disciples look at one another in shock? Did they start whispering, “Did you see that! ?” Not sure. What we do know is this. Yes, Jesus created faith from a glass of wine. They witnessed the power of Jesus’ works. “In fact, no prophecy ever came by the will of man, but men spoke from God as they were being carried along by the Holy Spirit”. The Holy Spirit led men to write Jesus’ story in the Bible and that’s where Jesus put the power! The Good News of the Gospel is the power to lead us to believe that Jesus’ greatest glory isn’t in water/wine or lepers cleansed or lame walking. Jesus’ greatest glory is that he came to earth to save us! Jesus came to change our lives watered down with sin into lives sparkling in his forgiveness. Jesus came to change our status before God from damned to delivered. Jesus died to pay and rose to prove that we are peace with God and bound for heaven. Yes, we marvel at Jesus’ miracles of power, but we don’t rely on the power of miracles anymore. We won’t find Jesus in the power of his miracles, but Jesus does reveal himself to us in the means of Grace. Jesus reveals his glory to us in his Word and Sacraments. Yes, Jesus Creates and Sustains faith through a glass of wine! It seems so simple, as simple as Jesus turning water into wine. Indeed, not very difficult for Jesus who created the universe by his command. But, Jesus also knows us. So it was simple, but not easy! He knows the cross is necessary because he knows how sin still clings to our hearts and causes us to easily become complacent. We know Jesus so well. We hear about him so often. We face the danger of getting too comfortable with his promises—not that we find ourselves really ignoring him, but putting him into the religion section of our lives. He’s there some place,,,you know—for those times we really need him. But, maintain the awe and respect, the worship and praise God demands….well, that’s too demanding and surely he can’t expect us to maintain such a high level of Christian living, can he? If you put Jesus away on one of your spiritual book shelves the day may come when you can’t find him when temptations come calling, or sin comes knocking, or doubt gets the best of us, or you just want to hit your head against the wall when you hear people that make worship a hit or miss, you know the once a month or once a quarter Christians say this: “Where was God when I needed him?” but you’ve learned not to be so blunt so it goes like this, “Where was the pastor when I needed him?” Friends, that’s a dangerous game to play. Yet, Jesus is so good and so merciful that he doesn’t give up on us. Look, don’t count on Jesus paying your bar bill at your wedding, but you might walk away untouched from an accident that totals your car. You might hear the doctor say he’s so surprised that your sick mom is still alive. If you don’t think our powerful God is still at work then slow down and look around. Check out the fingers and toes on a newborn. Watch a sunrise. Listen to the waves roll in and out. Jesus continues to send his powerful signs that point us to his glory just like he did at the wedding of Cana. That day the disciples saw his powerful works and heard his powerful words and put their faith in him because of a glass of wine. she found Jesus in the Temple and heard him say he had to be in his FATHER’s house! She has been pondering these events for 30 years. Don’t you think she, if she wasn’t at her son’s baptism, she would have heard about the dove, the voice calling her son into ministry?!?! So, Mary’s had learned not to be put off at all by Jesus, her Savior. She believes with all her heart in her Son who can create a Glass of Wine according to his will. So, let’s strip away all the things we can talk about the Wedding of Cana and talk about a really neat contrast. Six disciples came to this wedding probably not knowing much about Jesus or what to expect. Jesus turned a glass of water into a glass of wine and created faith in their hearts. Mary came to this wedding knowing lots about Jesus. She put her faith in Jesus before he turned water into wine. This might be your take away today. You really don’t know what’s coming into your life. Sometimes our plans line up with God’s plans, and sometimes they don’t. Sometimes we tend to play the short game—what’s going to happen tomorrow of next week. The Lord tends to play the long game—what’s going to happen for eternity! Sometimes our water is turned into wine and sometimes it isn’t. Crashes happen and we get hurt, or not. Disease strikes and we get healed or not. The sun doesn’t always shine every morning and the tide of success doesn’t always come into our lives. No matter—whether Jesus turns a glass of water into a glass of wine or not. What matters is that Jesus continues to create faith in our hearts through his powerful means of grace to focus on the blessings that are beyond expectations. His Powerful Word and his Powerful Works through baptism and the Lord’s Supper continue to create and sustain faith. So, today at the Lord’s Supper, believe! Receive the cup of wine as the Lord continues to strength your faith through his powerful works and word. Amen!